On Thursday, March 8, PBA Galleries will present a sale of Fine Literature and Fine Books with over 350 lots of classic fiction, popular literature, poetry, fantasy mysteries, and more. In addition, there will be offerings of fine bindings, early printed books, fine printings and assorted rarities. A rare signed limited edition of John Steinbeck’s In Dubious Battle dates from 1936. One of only 99 copies published by Covici Friede, the volume is signed by Steinbeck in the colophon and is housed in a replica of the original slipcase (Estimate: $4,000-$6,000). Also featured in the sale is the 1882 Author’s Edition of Walt Whitman’s Leaves of Grass. 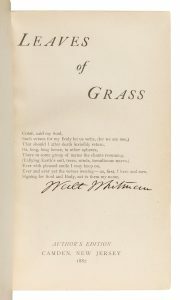 Signed by Whitman on the title page, as are all copies of this edition. Less common than the 1876 “Author’s Edition”, it is believed that there were not more than 100 copies of this issue, all signed. The sheets for this issue were salvaged by Whitman from an edition which was banned in Boston. A new title page was added in Camden and copies were distributed to friends (Estimate: $2,500 -$3,500). Vanishing Animals with text by Kurt Benirschke contains 16 color plates from silkscreens over collage by Andy Warhol and other illustrations from photographs. 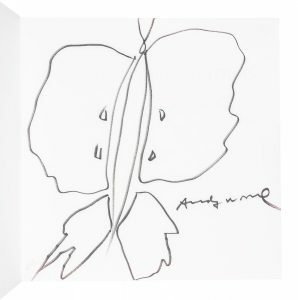 Included is a full-page felt pen sketch of a butterfly by Warhol signed by the artist. Warhol also signed the book on the half-title page and on three of the color plates for a total of five signatures in this moving examination of the ongoing and ever-accelerating extinction of members of the animal kingdom. Inspired by the supposed real life experiences of convict Ed Morrell, The Star Rover is Jack London’s novel of time travel and the out-of-body adventures of a prisoner in solitary confinement in San Quentin prison. This First American Edition is offered in the scarce pictorial dust jacket that duplicates the colorful frontispiece by Jay Hambridge (Estimate: $1,500- $2,500). 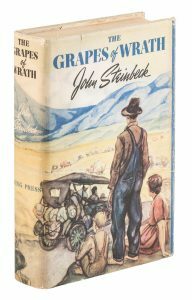 Another highlight in its original dust jacket is an unusually nice first edition of John Steinbeck’s The Grapes of Wrath. This Pulitzer Prize-winning classic is Steinbeck’s greatest novel, an epic story of migratory workers during the Great Depression of the 1930s and is perhaps the most influential and best remembered book of its era (Estimate: $3,000 – $5,000). Other featured lots in the sale include: the first French edition of Swiss Family Robinson in 4 volumes from 1814 attractively bound in period mottled calf (Estimate: $1,000-$1,500); an inscribed first printing of Tim O’Brien’s first book, If I Die in a Combat Zone Box Me Up and Ship Me Home, which is based on his experiences as a foot soldier in Vietnam (Estimate: $1,000-$1,500); Lewis Carroll’s Alice’s Adventures in Wonderland and Through the Looking Glass, finely bound in full polished orange calf stamped in gilt, by Riviere & Son (Estimate: $800-$1,200); and an advance reading copy of Harry Potter and the Sorcerer’s Stone, the American edition of the first book in J. K. Rowling’s wildly popular series (Estimate: $1,000-$1,500).